November 2018 airportbusiness 35 FACILITY MAINTENANCE their complexity. It means that a long-term preventive maintenance program should be a part of any lighting upgrade. Why Preventive Maintenance is a Best Practice for Airport Lighting With the high demand placed on airport lighting, having a system that functions reliably is crucial. Here’s why planning for preventive maintenance is a key step in any upgrade: Improve Security and Safety While airports are striving to become more comfortable and welcoming for passengers, safety and security are still paramount. Security cameras need proper lighting to function well, and well-lit terminals help passengers navigate more easily. When lighting output dips, or if LEDs stop functioning, it threatens safety and security. A preventive maintenance program ensures that the people and systems dependent on proper lighting aren’t put in jeopardy. Maximize ROI After investing time and money into lighting upgrades, failing to maintain them proactively is like tossing that investment down the drain. It leads to higher repair and replacement costs and drives up unplanned downtime. And when repairs aren’t made until there’s a crisis, there’s no way to know if all the components are operating optimally. The result is a negative impact on return on investment (ROI). A preventive maintenance program prevents costly rush charges and minimizes disruption. Inspecting, cleaning, keeping commonly used parts properly stocked and ensuring that controls are working properly allow facilities managers to prevent and spot issues before they become costly headaches. Operate at Peak Performance One of the reasons companies hesitate to upgrade to LEDs is cost. While they have long-term savings potential, lighting upgrades require a substantial upfront investment. Those upfront costs are often mitigated by savings in energy and maintenance costs. To maximize those long-term savings, LED lighting systems need to work at peak performance, all the time. One way to keep lighting output degradation at bay is to clean the LED and surrounding components. When dirt builds up on the fixture, lamp or lens, the LED will emit less light, reducing quality while still consuming energy. Not only does cleaning ensure the light maintains its brightness and color, it also helps keep the thermal protection features of the fixtures clear of debris that impacts their performance. Another way to maintain peak performance is by checking connection points, which can loosen over time due to normal wear and tear. Checking them periodically ensures that bulbs won’t flicker or fail to turn on. Taking these proactive measures helps to keep the entire system operating optimally, which ensures maximum savings and quality. Extend the Lighting System’s Lifespan LED lighting systems are just that – systems. As with any electrical system, components like the internal drivers, surge protectors and integrated motion sensors can fail, impacting the lifespan of the LEDs. The average lifespan of most LEDs is around 50,000 hours, with some estimates going as high as 100,000 hours. But for a bulb to realize that potential, it’s dependent upon the other components in the system. When these components fail, the impact often goes unnoticed. A poorly functioning driver may cause overheating – not enough to fry the LED, but enough to reduce its lifespan. Lighting output may decrease slightly, but not enough to be noticed by the human eye. That’s why it’s important to perform regular site visits to verify that components are working properly. It reduces the number of times parts need to be replaced and allows the LED bulbs to operate for their full lifetime. Increase Safety Poorly functioning lighting is tied to numerous negative outcomes, such as increased chance of accidents and security incidents. The safety issues that come with these outcomes are costly. Regular maintenance can offer protection from these risks. One of ABM’s clients was facing this exact issue. Because they had the proper lighting maintenance, along with records of the lighting work performed, they took a proactive approach to preventing safety incidents and prevailed in ensuing litigation. 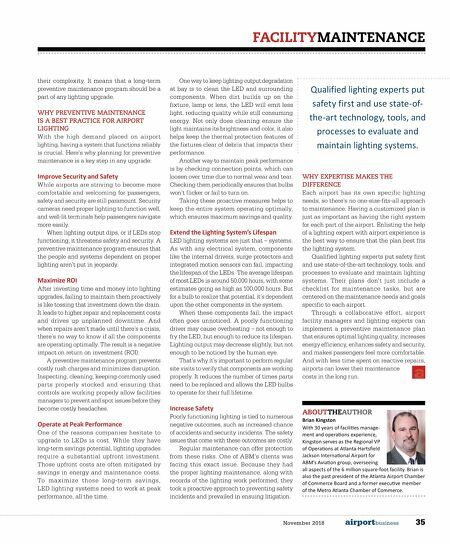 Why Expertise Makes the Difference Each airport has its own specific lighting needs, so there’s no one-size-fits-all approach to maintenance. Having a customized plan is just as important as having the right system for each part of the airport. Enlisting the help of a lighting expert with airport experience is the best way to ensure that the plan best fits the lighting system. Qualified lighting experts put safety first and use state-of-the-art technology, tools, and processes to evaluate and maintain lighting systems. Their plans don’t just include a checklist for maintenance tasks, but are centered on the maintenance needs and goals specific to each airport. 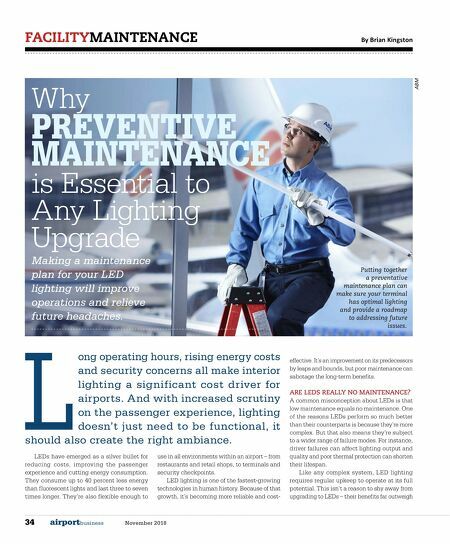 Through a collaborative effort, airport facility managers and lighting experts can implement a preventive maintenance plan that ensures optimal lighting quality, increases energy efficiency, enhances safety and security, and makes passengers feel more comfortable. And with less time spent on reactive repairs, airports can lower their maintenance costs in the long run. ABOUTTHEAUTHOR Brian Kingston With 30 years of facilities management and operations experience, Kingston serves as the Regional VP of Operations at Atlanta-Hartsfield Jackson International Airport for ABM’s Aviation group, overseeing all aspects of the 6 million square-foot facility. Brian is also the past president of the Atlanta Airport Chamber of Commerce Board and a former executive member of the Metro Atlanta Chamber of Commerce. Qualified lighting experts put safety first and use state-of-the-art technology, tools, and processes to evaluate and maintain lighting systems.